I am ashamed to admit that my first aid knowledge is barely existent. The last time I did a first aid course was at junior school when I was around 10. When I had Munchkin I kept telling myself that I needed to go on a course but time just flew by and it wasn’t top of my list (it should have been). Now Bee is in my life too I keep telling myself again to get myself on a course. Knowing what to do in situations could literally be the difference between life and death. I heard about the British Red Cross Baby and Child First aid app through Mumsnet who were looking for reviewers of the app and was keen to try it out. Anything to help me know at least the basics of what to do is appreciated. 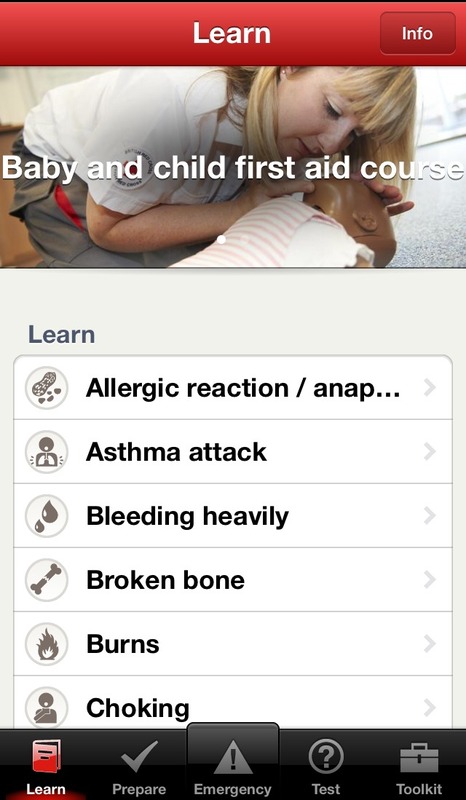 British Red Cross say “Our FREE app is packed full of essential first aid learning for parents. It includes videos, quick tips and self test sections to test your knowledge. App users can search for their nearest accident and emergency department anywhere in the UK using the hospital finder. There is a useful section on preparing for first aid incidences and a medical records section to record childrens medication and allergies. The Baby and Child First Aid app has been designed and developed for parents and carers of children to make learning first aid easy and accessible. Sounds like something every parent should have! So is it worth downloading? 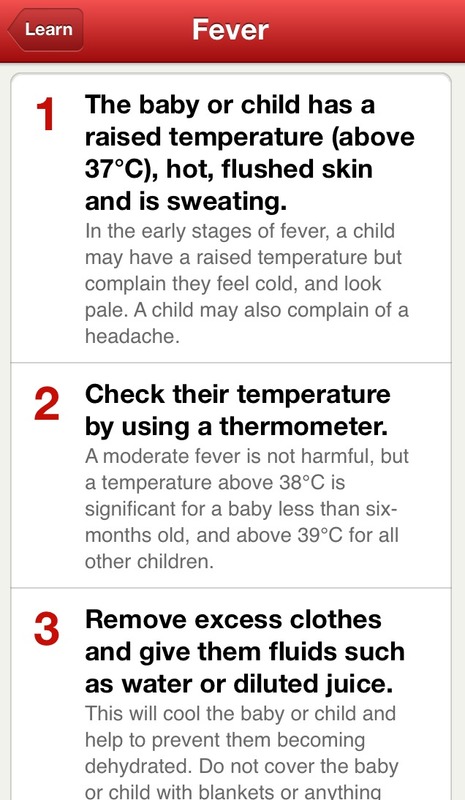 It is so easy to panic when your child has a fever and a lot of mums will turn to other mums on forums and Facebook. There is nothing wrong with that as you can get good advice, but getting it straight from the British Red Cross app is ideal as it is a trusted source. The prepare section gives you handy tips on preparing for some situations such electrical incidents and being out and about and gives you a checklist of things you need to think about and if going out and about, what you need to take with you. One of the tips that I read which is so simple is to teach your child how to call 999. It made me realise that I have in fact not taught my 7 year old this, and she is more than capable of learning and doing it if the need arrives. The emergency section is basically what it says. It gives advice on what to do in an emergency situation with short videos and pictures. Emergency situations included are burns, choking baby and unconscious child. What I love about this app is that it also tests you on what you have learnt. For example, one of the questions is ‘Which four signs could indicate a child is choking’. This is great to test your knowledge and ensure you know what to do/recognise symptons. The Toolkit is a section to help you find a hospital and also a place to add your child’s record. I believe this app is a must have for all parents. Even if you have been on a first aid course it is a good refresher and handy to have with you incase you come across a situation you are unsure how to deal with. bloggers who have volunteered to review products, services, events and brands for Mumsnet. This review entitles me tobe entered into a prize draw for a first aid learning pack from the British Red cross. This is brilliant. I am very lucky that I have been first aid trained – first at work and I now have paediatric first aid training because I am a child minder – you would be impressed by me fashioning a sling out of a baby blanket when my son broke his arm and saving my son from a choking incident (never been so scared in my life). I think first aid training is something every parent should be taught and I am pleased to say that the kids do it at school now too. This app looks fabulous and I shall be downloading it – its great to have something to jog the memory if anything else! This is a great idea. I also haven’t done first aid since my oldest was small so need a refresher. I really think this is a great app, in fact I’m going to download this now! What a fantastic idea. As you say, it’s easy to panic when your child becomes ill. I think it’s important to be able to know what to do if an emergency occurs, and also to be able to look up symptoms to be able to gague the seriousness of illness when our children are poorly, and take the most appropriate action. This such a great idea, thanks for blogging about it. I did a emergency first aid course when I had my eldest, but I’ve always worried that my mind would go blank if it came to it, so I will definitely get this app. i was trained as a nurse and sometime I do forget. this is a great app to download. I first heard about this app when I was at The Baby Show last October and decided to take a free first aid for babies class. I learnt so much in the short class and backed up what I learnt by downloading the app too. Both came in very handy when my little girl decided to shovel too much toast in one morning while we were started to introduce solids! Great app and more parents should use it. I used to be Red Cross Cadet for 3 years so I vaguely remember stuff.When my youngest swallowed a large sequin when she was 8 months old the first thing I did was ring for an ambulance.I really should have some kind of app or at a book so the kids can read it too. Thanks for this. It’s not something any of us really like to think about but I’d rather be prepared than not. I’m going to download it now. What a fantastic idea! I had a free first aid for parents course when D was little but I have to admit that was so long ago that I’m not sure it would be of any help to me. Thanks for sharing! I’ve got a few first aid apps, but like that this one us specifically for parents. Really good idea, even when you think you know what to do, it’s easy to panic. This is great! I will keep this close for in case of an emergency. I will also pass this along. Glad I found your review of this app. Downloaded it in an instant and let all my mummy mates know too. Thanks.